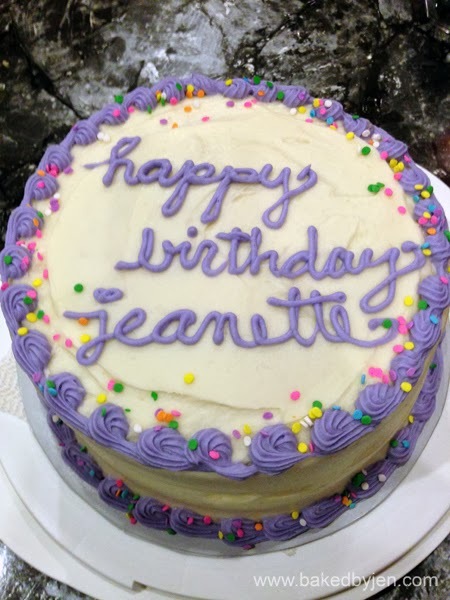 Funfetti cake (white cake with sprinkles) for my sister's birthday. Preheat oven to 350F. Prepare 2 8-inch round cake pans by lining them with parchment paper and greasing the paper. Mix all of the dry ingredients together in a large mixing bowl. Add the softened butter, 1 tablespoon at a time. Once butter is all incorporated, add the eggs, one at a time. Scrape down the bowl after the addition of each egg. In a 2 cup measuring cup, stir together all the wet ingredients. Add the mixture in, 1/3 at a time, to the batter; scraping down the bowl after each addition. Stir in the sprinkles by hand until fully incorporated. Do not over stir as this will cause excessive color bleeding into the batter. Poor batter into the prepared pans. Scatter a few more sprinkles on the surface. 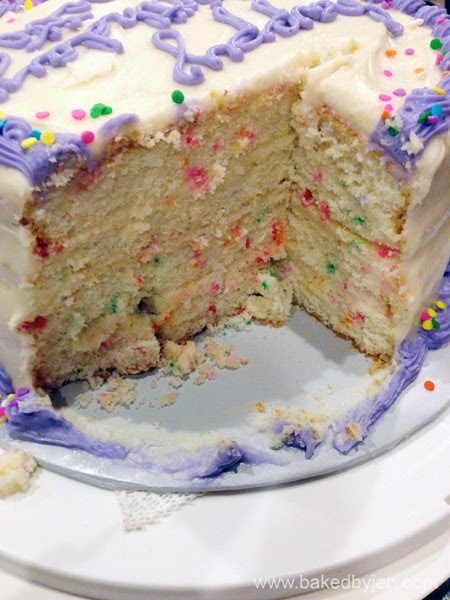 Bake for 25-30 minutes or until a toothpick inserted into the center of the cake comes out clean. Remove cake from pans and let cool completely on the racks. Frost as desired.